Since work began in February 2017, crews have completed all piers and abutments that will support the 2,700-ft.-long Salt River Bridges. Meanwhile, work is progressing on the bridges’ girders, decks and railings. The longest bridges on the Loop 202 South Mountain Freeway, two half-mile-long spans over the Salt River, are quickly emerging in Laveen, Ariz. Construction is now two-thirds complete on these bridges, which will serve growing areas of the southwest Valley when the freeway opens by late 2019. Travelers in this area currently have access to just one all-weather crossing of the Salt River between 35th Avenue and Avondale Boulevard: the city of Phoenix's 51st Avenue bridge. When the Salt River flows, significant traffic congestion occurs, particularly along 51st Avenue. Since work began in February 2017, crews have completed all piers and abutments that will support the 2,700-ft.-long bridges. Meanwhile, work is progressing on the bridges' girders, decks and railings. 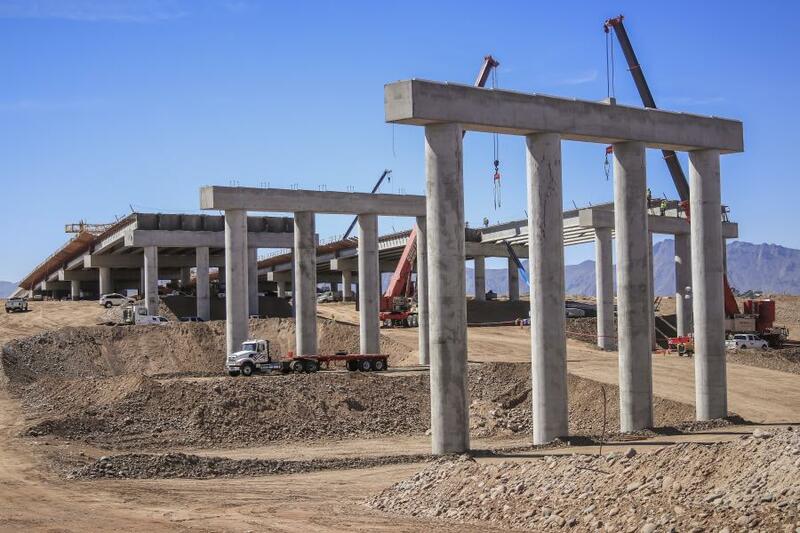 The concrete girders, which are manufactured locally, are the longest precast girders ever installed by the Arizona Department of Transportation. Each weighs 169,000 lbs. and is 170 ft. long. Once the girders are transported to the construction site, two large cranes work in tandem to hoist and methodically place them, with some girders needing to be lifted more than 50 ft. above the riverbank. To date, 238 of 292 girders have been set. By fall 2018, after all the girders are in place and the bridge deck's surface is finished, construction equipment will be able to travel across the bridges for the first time, aiding earthwork needed to build the freeway mainline. Connect 202 Partners, the developer of the South Mountain Freeway, will then haul more than 700,000 cu. yds. of dirt material across the bridge to locations north of the Salt River. The South Mountain Freeway will provide a long-planned direct link between the East Valley and West Valley and a much-needed alternative to Interstate 10 through downtown Phoenix. Approved by Maricopa County voters in 1985 and again in 2004 as part of a comprehensive regional transportation plan, the South Mountain Freeway will complete the Loop 202 and Loop 101 freeway system in the Valley.